Dandelion jelly is a real surprise treat, which is also known as dandelion honey. Dandelion jelly is one of those amazing recipes which you thought were impossible. Dandelion jelly taste can be compared to honey, and that’s why it’s frequently known as dandelion honey. Whoever sees dandelion jelly for the first time is completely amazed and adventurous at the same time to give it a go. So, if you are around fields full of fresh and juicy dandelion flowers, you are bound to consider making this dandelion jam at home! What is the Dandelion flower? The dandelion flower petals can be easily recognized because of its yellow flower head, which closes during the night and reopens every morning again. The yellow petals turn white in time with the seeds dangling at the bottom. Some people will know it as a dandelion puff and kids love to blow away the seeds. The head is carried by a hollow stem which contains a white sap and usually, each flower comes with a set of jagged leaves. Dandelion flower head, leaves, sap and roots can be all consumed. Dandelion sap (the white stuff) is used against kidney stones and to treat diuretic conditions, liver and bile problems, and skin difficulties. Further, the dandelion is known to promote appetite, maybe that’s why the cows love to chew on them when they are chilling on the fields. 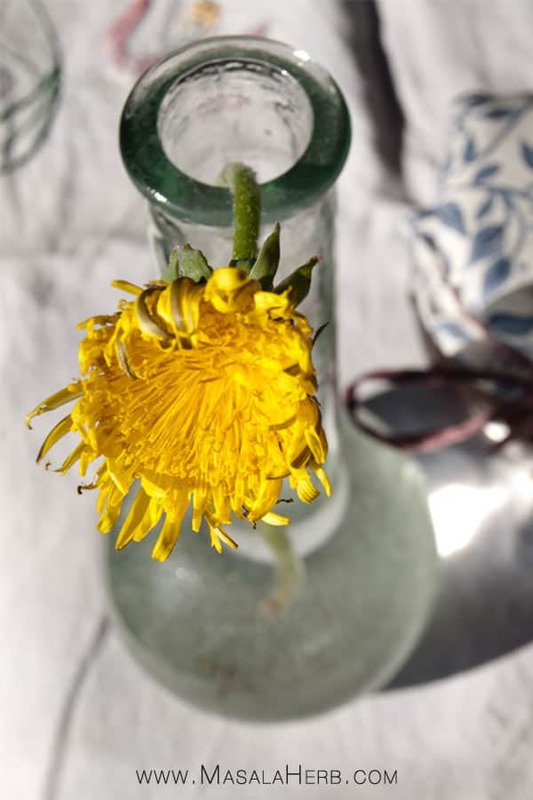 Since the dawn of time, the dandelion flower was known to be a healing plant and was in great use in various traditional culture’s folk medicines. The Dandelion flower was firstly noted and mentioned in Chinese and Arabic scripts at around 600 a. C. but even the dark medieval time of the world had adopted the healing properties and uses of the dandelion plant. The plant contains a bunch of nutrients which may be worthwhile to be mentioned here. The yellow sweet dandelion blossoms mostly hold precious Carotenoids (Eyes and skin) and Vitamin C elements (Antioxidants). Further, it contains minerals such as Inulin (management of diabetes) and Potassium (control of hypertension). That proofs that it is much more valuable and of use than we ever imagined! Where to find Dandelion flowers to make Dandelion Jelly? I remember my grandmother who would collect dandelion leaves to add them to salads or she would make a dandelion tea of them. So you see, the dandelion flower is not just one of those hazardous wildflowers, but in fact a very useful plant. The awesome part is, that Dandelion flowers grow pretty much everywhere in the northern hemisphere. So you might just find it outside your house growing and since nobody knows the value of the plant, nobody will be bothered if you collect them all for your own culinary use. Dandelions can be easily collected in the fields for free. You can use a Dandelion picker or puller to help you collect the flower buds. Usually, dandelion fields are not contaminated with poison, if you are not sure, ask the local farmer (or whoever owns the property). When are Dandelions in Season? The yellow, humble dandelion flower, can be commonly found from April onwards. The plant tends to grow twice a year in spring/summer. Once in spring and a second time in summer. A harsh winter might reduce the dandelion summer to only a one-time field growth. Sweet Dandelion Jelly is truly a delightful breakfast treat. Forage your own dandelions and make this amazing jelly! Pick your flowers freshly from the fields and rinse them well to get rid of any impurities and insects. It helps to add a cap of vinegar to the water to get rid of insects when washing the flower heads. Keep dandelion flowers to dry for 2-3 days in the sun. After they are dried, pick out the yellow flower blossom and keep them in a bowl. Discard the green parts, those are bitter. After cooking strain the juices from the flowers well and press out all the juices of the flower/fruit mixture. Discard the flowers and orange pieces and take the strained liquid back to low heat together with the sugar and lemon juice. Stir well and let it cook slowly until the jelly sets. Check if the jelly is set with a candy thermometer. The setting temperature is 220 Fahrenheit/ 105 Celsius. You can also test the setting by dropping some of the hot jelly on an ice cold plate. If it runs it’s not ready and needs more cooking, if it’s set you are good. In the meanwhile sterilize the 2-3 Jars and keep a few drops of rum into the inner jar covers. That will help to preserve the jelly for a longer period. Fill your sterilized jars to the rim, close with the lid and turn upside down to create a vacuum. Leave it upside down overnight. The next day label your jelly and store in a cool and dry place. Store in the fridge once opened. The flowers need to be picked freshly with the head opened and not closed. Pick only flowers from untreated (nonpoisonous) fields. 1 serving = 1 Teaspoon, 70 servings = about 3 jars. Dear Reader, in your food culture, do you use flowers as food? That’s great post helene! I’ve recently discovered using flowers in cooking, and am looking forward to learning more new ideas. this is great, I bet I can find dandelions just about anywhere! What a great post! I’ve had dandelions in salads before, but never jelly. Wonderful idea. I’m looking forward to see what else you do with dandelions. Excellent read – thanks. I love this jelly! Would adding pectin make a difference to the jelling? Pectin isn’t required because it is jelling and preserving well without it. What an interesting recipe. So unique. What a wonderful thing to draw inspiration from! What a delightful recipe!! I’ve never had dandelion jam but it sounds so good. How creative! I like the sound of using dandelions. How fascinating! I never heard of making jelly from dandelion flowers! You have really piqued my interesting with this jelly! I’ve heard of it, but never put much thought into it until now. It makes such a gorgeous jelly and what a great use for something that grows so easily and wild. In fact, my whole front yard looks like a field of dandelions. I’m going to have to pick the blooms before the husbands mows them down. Thanks for sharing this. This is a great challenge for me. I started making this jelly with my grandson a few years ago .his favorite is dandelion juice infused with orange skins and cinnamon then turned into jelly. Lovely on crackers with cream chese and a spoon of jelly on top . Hi, sweet friend! It’s been WAY too long since I’ve stopped by. What a fun, unique idea for an addition to my morning toast. Love that the maligned dandelion actually offers health benefits—so cool! I had NO idea that those annoying weeds in backyard could be made into a jelly! Talk about upcycling! I’m definitely going to give this a try, thanks so much for this recipe! How long is it good for ? Like any other jam or jelly. Unopened for up to a year in a cool, dark and dry place (if you have sterilized your jars). Once opened within a few months if stored in the fridge. I’m going to try your recipe but I’m really interested….. yours is the only recipe that goes to the step of drying your flowers instead of making an instant dandelion ‘tea’. Have you tried both ways? What’s the difference? Most of the time I think it makes sense to let flower blossoms dry because this removes the water content and leaves a much higher concentration of the active ingredients in the remaining plant. Besides drying the dandelion flower will make it easier for you to pick out the green part (which are bitter). Also, if you want you can pick a whole load of dandelions (because they are seasonal), dry them and store the rest for the remaining of the year to make teas or something else. When we make a tea, for example, we try to use dried blossoms because they tend to be more intense. Chamomille is a good example too, drying the flower buds gives a tea more flavor. At the same time, there are instances where flowers don’t need to be dried, for example, elderflowers when turned into a syrup (the flowers are not boiled but left in a mixture for days). Sure you could use whole fresh dandelion flowers but then you would need by far more flowers to get some taste and to infuse the jelly. The dandelion jelly recipe above is the way they do it in the alps for ages. Well I have made this twice now! What a wonderful recipe! I was able to give a few small jars to loved ones on Mother’s Day! I am completely obsessed and catch myself scoping out new spots of flower patches! It’s great to know the jelly lasts so long in the fridge! 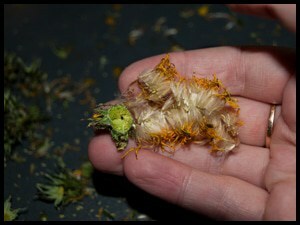 Awesome idea to save dried flowers also! I will be stocking up! Thank you so much for sharing! Hi, this may be interesting you: Dandelion Jelly - Dandelion honey!